The FDA's announcement that teen usage of e-cigarettes has reached frightening levels has traditional tobacco companies surging Wednesday. Shares of Altria Group, Inc. (NYSE:MO), a tobacco company with brands such as Marlboro, Black & Mild, and Copenhagen, among many others, are up nearly 7% as of 12:50 p.m. EDT after the Food and Drug Administration announced it might ban all flavored e-cigarettes. As a group, tobacco stocks jumped Wednesday after the FDA threatened to pull e-cigarettes due to their widespread popularity with teens. The FDA chief went as far to say teenage use of e-cigarettes had reached "an epidemic proportion." Five brands in particular -- Juul, Altria's MarkTen, Imperial's Blu E-cigs, BAT's Vuse, and Japan Tobacco's Logic -- have been ordered to create plans within 60 days specifying how they will address teen e-cigarette usage and how they will work to prevent teens from using their product going forward. Investors clearly welcomed the FDA crackdown, as e-cigarette products have been a growing threat to big tobacco companies, even if some have created their own e-cigarette brands. 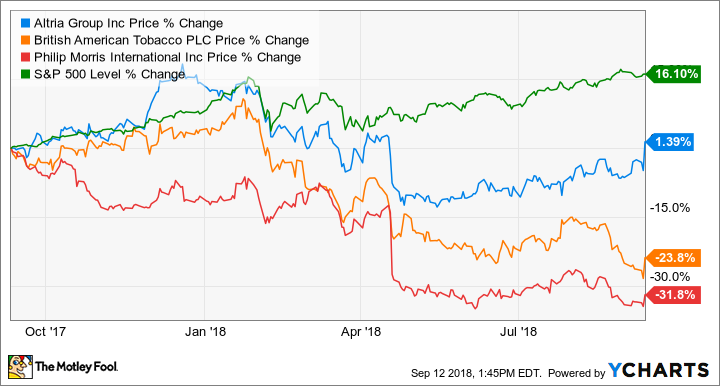 Wednesday's stock price pop could prove short-lived if the FDA's move ends up being simply a reprimand rather than a sign of a stronger regulatory stance in the future, but for now it's a clear positive development for traditional cigarette companies.